Standing up and pedaling my bicycle through an intersection, I glance ahead and to the right -- there is a person sitting on the grass in a yard. He or she has long wavy blond hair, and is wearing sunglasses. A terrorist on a suicide mission hijacks an airplane and bolts the cockpit door. Below, an armed soldier watches in shock as the huge jet plane, flying low, heads for a deliberate crash landing, pointed straight at the World Trade Center. After that crash, another criminal in another plane flies directly towards the WTC towers, onto which he crash-lands. No, I'm not talking about 9/11, I'm describing some of the most surreal scenes in this now painfully-dated sci-fi classic in which Manhattan was turned into a giant Alcatraz. Made in 1982 and set in 1997, this movie is yet another great thing that was ruined for us by the terrorists of 2001. The Ember Update: Freedom, Moon Cake, Is It Not True?, etc. On Monday, I got really angry. 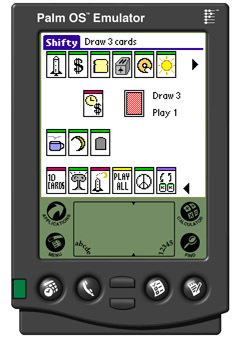 We got email from an alert fan informing us of a new game for the Palm that had just been made available as a freeware download. "It seems very much like Fluxx from the description," we were told. Curious, I pulled up the webpage and was shocked to see that "Fluxx-like" was an understatement... this game WAS Fluxx, implemented almost completely, using tiny little graphical cards. The only difference was that this game was called "Shifty" and was apparently created by a company called No Sleep software. It was my game, with a different name, and I was being given absolutely no credit. Needless to say, I was livid. I fired off the first of several angry emails to NoSleep, who quickly apologized and explained their confused notions of intellectual property. Being from a world where programmers constantly re-implement classic games under different names, they seemed to believe that trademark law was all that really mattered. By changing the name "to avoid trademark issues" they apparently believed they were doing nothing wrong. 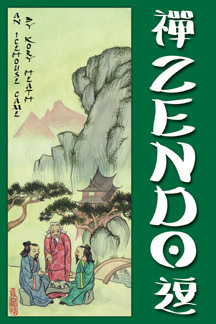 If you read last week's update, you'll remember that we chose Alex Bradley to do the art for the Zendo gamebox; here we see his latest work-in-progress, which has come a long way from the sketch we put up last week. Cool, huh? Have you played any games today? Fluxx has been picked up by Borders! Kristin (and more recently, Alvaro) has been trying to get this account for a really long time, so even though they're initially only going to stock it in 50 of their 400 stores, we're psyched. In fact, soon we'll be announcing a special promo we're planning for the occassion!